After three recordings co-leading the Jazz Brothers with pianist Gap Mangione, trumpeter Chuck Mangione headed his first solo record date. The CD reissue adds alternate takes of "Solar" and "The Little Prince" to the original LP program. Joined by an all-star rhythm section (pianist Wynton Kelly, bassist Sam Jones and drummer Louis Hayes) plus Joe Romano on tenor, flute and alto, Mangione mostly sticks to bebop on four jazz standards (including Charlie Parker's "Big Foot") and three of his originals. Although only 21 at the time, he holds his own with the illustrious rhythm section and was starting to display his own musical personality. His next recording as a leader would not take place until 1970, and by then he was starting to explore the pop-jazz formula that was to gain him great commercial success. 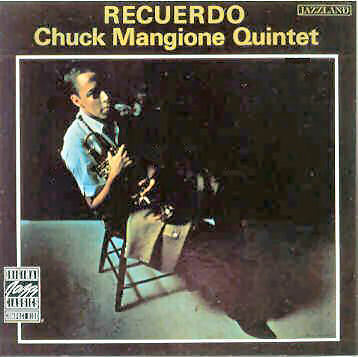 Chuck Mangione is one of several talented "discoveries" to be credited to Cannonball Adderley, who first heard Chuck as a teen-aged trumpet player co-leading a band with his brother Gap in their home territory of upstate New York. The debut album by the "Jazz Brothers" (as that band became known) was produced by Adderley, but Chuck's first solo effort--for Riverside Records' subsidiary Jazzland label--was put together by Orrin Keepnews. It gave the youngster the valuable support of a major-league rhythm section: Wynton Kelly, Sam Jones, and Louis Hayes (the latter two then key members of Cannonball's group), and launched a long and formidably successful career.